Better situations are desirable, right? You figure they’ll let you work better; let you be more on top of your routine and be able to establish and maintain a rhythm that lets you get it done, whatever “it” is. It’s not a guarantee, though. It’s not much different when it comes to trades in sports, either. In particular, mid-season deals that lead to better situations for players often provide dubious outcomes at best. Case in point: Drew Pomeranz and the Red Sox. When Pomeranz was acquired in mid July he was rolling through the best stretch of his career: 10.15 K/9, 2.47 ERA, 3.15 FIP, and he had already racked up 2.5 WAR through 17 starts. It was the other side of the coin in his next 13 with the Sox: 4.59 ERA, 4.78 FIP, less Ks, more than twice as many HR/9, and only .5 WAR. All of this occurred as Pomeranz started throwing his new-found money pitch – a cutter – less and less. He added it at the start of the season and was using it to play between his four-seamer and curveball. In June, it accounted for as much as 20% of his pitches, and generated a near-equal amount of whiffs. In July, he threw it 17.36% of the time, then 12% in August, 9.35% in September, and barely at all in three October appearances. 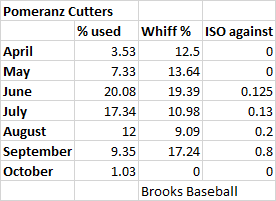 Cutter usage shows by far the biggest difference in Pomeranz’s performance in Boston. The changes in his overall numbers are also easy to see. Another big difference between San Diego and Boston besides the cutter usage was Pomeranz’s BABIP. Despite working the plate in an almost identical way, it rose 66 points, from .240 to .306. Maybe that has you thinking, “Ahh, yes. That’s a big deal and explains a lot.” And it is a big deal – a spike like that is almost a lock to jack up a pitcher’s numbers. But I don’t know how much it explains by itself, because even .306 isn’t damning. Hell, Noah Syndergaard’s BABIP last year was .336. About how he worked the plate: a couple numbers differ. His o-contact% went up 4.1% with Boston, from 55.9 to 60. Opponents also generated 8% more hard contact against him, with that number going from 28% to 36%. But neither of these are likely to turn a pitcher’s game on its head. It’s curious that as he phased out the cutter, his peripherals took relatively small dings, but the results were so dramatic. There’s a theory about cutters out there that says they sap fastball velocity. Whether it’s true or not is debatable, but it seems grip might have an impact – whether the pitcher holds it more like a slider or a fastball. 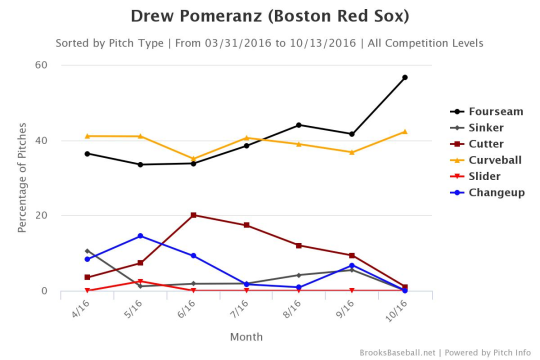 Pomeranz’s average fastball velocity, by month, was up and down all year. (I’m ignoring October because those appearances were in relief and he didn’t have to try to go deep in the game.) It was also at its lowest the month after he threw the most cutters, and during the one where he threw the second most cutters. He generated a bunch less whiffs from cutters between those months, too. 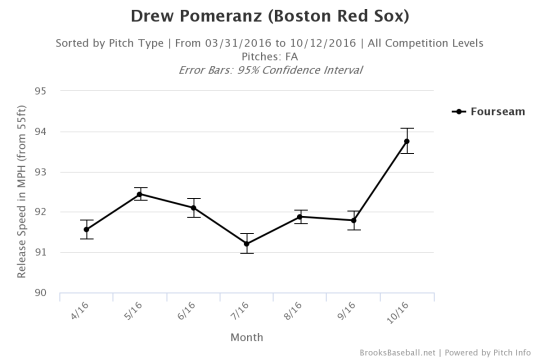 Anecdotally, Pomeranz seems to reinforce the notion that the pitch could make a fastball sluggish. He introduces a particular wrench, though. He threw a career-high 170.2 innings in 2016, which is more than 50 additional frames than he ever had. Maybe stamina played a role in performance. Regardless what happened with the cutter, Pomeranz became more predictable. By slowly eliminating it, he went back to being the two-pitch pitcher with middling results that he’s been through his whole career. While he’s slotted in as a back end starter in Boston right now, finding the sweet spot with his cutter usage could make him much more than that in an already stacked rotation.